Plows are thought to have been invented in Mesopotamia in approximately 3000 BC. Plows in the ancient Greek culture were very simple devices, which would be improved in Roman times. Sometimes a wheel was added to improve the functioning of the plow. 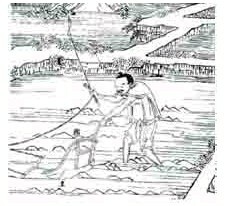 In China, plows made of iron were in use in in about 300 BC, and moldboards, which turn the soil over in a furrow, were in use in the first centure BC. Moldboards were not used in Europe until the late 10th centure. When Chinese agricultural implements were shown in Holland in the 17th century, they were far in advance of European technology. The Roman plow was adequate for plowing the dry Mediterranean soils, but proved inadequate for the heavier soils of Germany and northern Europe. 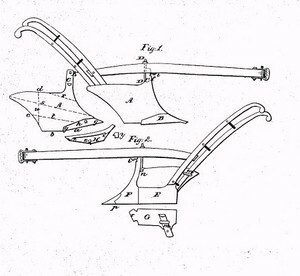 A heavy plow was developed for those regions. A heavy plow of medievel times. 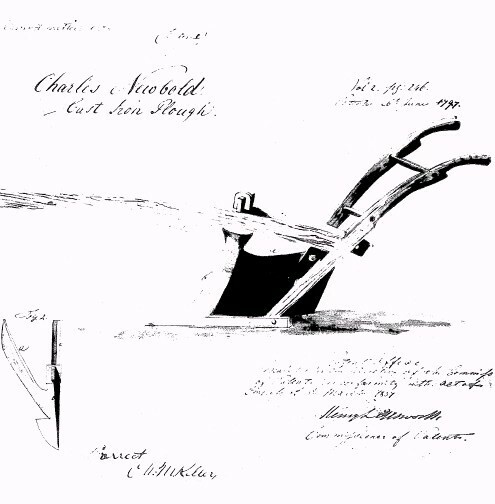 In the American colonies, early plows were imported until the local blacksmiths learned how to make them. 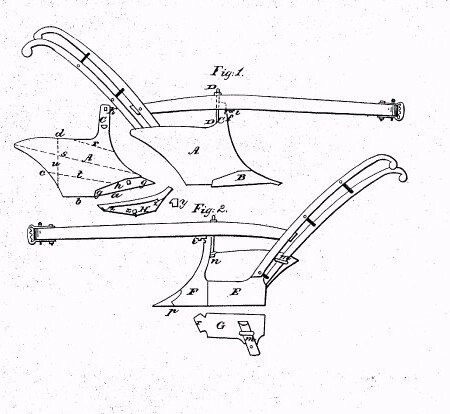 An early advancement in plows came from Thomas Jefferson. 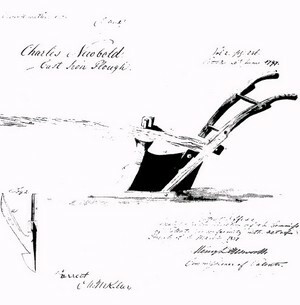 Jefferson's "Moldboard of Least Resistance"
The first American plow made of cast iron was made by Charles Newbold in 1797. 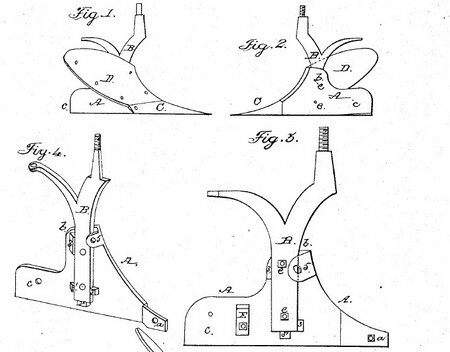 The figure below is from his patent. The disadvantage of this plow was that if it was broken, the whole plow had to be replaced. This problem was solved by the plow of Jethro Wood, which had iron parts which were interchangable. Thus, if one part was broken, it could be replaced.